The MTC's Operations Committee has done it again... more of our taxpayer money being fried on expensive toys. They met last Friday, May 13th to discuss about six major expenses. The shocking expense is a purchase for Caltrain. The MTC intends to spend $85,000 so Caltrain can accept Clipper payments with handheld card readers (they will purchase eight of them); the intention for the portable card readers is to use them for "collection of fares at special events" such as Stanford football games and after ballgames at AT&T Park. The cost of each portable reader is a whopping $10,625 each. In my personal opinion, they should be able to find something a lot more inexpensive and able to handle the same job. Just one of those readers costs about one-third of my salary, but the MTC intends to spend that much crazy money on a device? I'm wondering if the MTC knows there are other devices out there that can likely do the same job for a lot less money. LA Metro's fare inspection teams uses a special cell phone that is small and very portable to verify fares and transactions to check on passengers' TAP cards (see product description). Even rival RFID transit card company Scheidt & Bachmann offers a cell phone product that can verify fares and charge fare cards with just a push of a few buttons (watch here, fast forward to 3:57). We all know cell phones costs a lot less money, and I don't think Cubic would charge ten grand for each device that can likely do the same job versus the ones the MTC wants to buy. The MTC could even invest just a little money for someone to create an Android or iPhone application and the necessary equipment (phone w/RFID reader attachment) to make it all work. 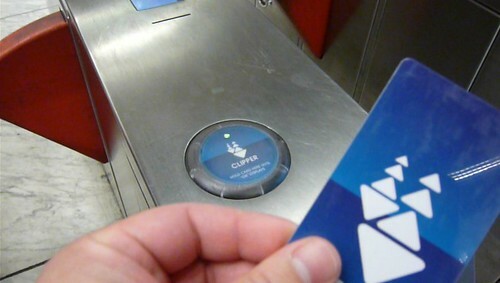 The MTC reports the a 14% growth in the "average weekday transaction volume" in the month of April of usage of the Clipper card and is primarily due to the mandatory transition of the paper "M" pass to an e-pass on Clipper. Other developments in the program includes the ability to add e-cash at all BART ticketing machines, new Clipper ticketing machines at all Golden Gate Ferry terminals, and a 50% reduction in phone calls to the Clipper customer service center after extensive outreach to Caltrain passengers. MTC intends to spend $500,000 to offer third party commuter benefit companies (e.g. Commuter Check and WageWorks) a 1% commission for each customer who utilizes the direct load benefit to have their passes/e-cash automatically loaded to their Clipper card account. Other transit agencies offers this 1% incentive, but as of right now, the Clipper card program does not offer it. Regarding the above bullet point, there is more information about why the MTC caved into the $2 monthly fee for those transit benefit users who utilizes third party programs. The MTC says that they have very little influence in the service fee because Cubic was the one who forced the fee to the third party benefit programs. The MTC had no choice but to agree to the $2 service fee for direct loading of passes/e-cash, but was able to make the transit benefit companies provide informed consent to all users about the fee by "opting in." This service fee will be in place for two years and will be renegotiated if the agreement is a failure. Only 4% of all Clipper users would be affected, and alternate methods are available to get away from the fees. Since buses and trains gets their Clipper card updates while in the yard (via wireless network), the MTC is going to spend $90,000 to improve wireless coverage on the largest bus and train fleet in the entire consortium, Muni. The goal is to provide "more consistent coverage in the SFMTA bus yards, so SFMTA vehicles will be better able to upload and download Clipper data on a regular basis." The MTC is going to invest an additional $73,000 to the contractor at the Embarcadero station's new Clipper customer service kiosk. The extra funding (on top of $289,200 already budgeted) will be utilized to increase staffing for the 2011-2012 fiscal year. Booz Allen Hamlilton Inc. has been providing technical oversight for the Clipper program and has a multi year agreement with the MTC. The MTC wants to amend their contract to add an additional $1.35 million for their services for the 2011-2012 fiscal year. Lastly, a budget item of $280,000 for the 2011-2012 fiscal year charges that AT&T bills MTC for telecommunication usage for the connection of all card readers, add value machines, and other devices connected to the Clipper network. With the mass confusion and frustration of the Clipper program for Caltrain, it seems the MTC's large investment in public relations is paying off due to a 50% reduction in calls regarding Clipper usage on Caltrain. The 1% commission is something that I'm stuck in the middle about. It's a large expense (half a million dollars a year), but if the MTC doesn't provide that incentive, the third party transit benefit companies may wipe out direct loading of Clipper card passes/e-cash as an option; this is due to the fact that other transit agencies offers a 1% incentive when customers uses their transit benefits to get their transit passes/ridebooks mailed directly to their homes. I'm upset about the $2 monthly fee being charged for those people who use third party benefit programs and requests for direct loading of passes and e-cash to their own Clipper card accounts. The MTC should have flexed its muscles a lot more; instead, they caved in and was only able to make a provision that every third party benefit program must provide informed consent that the passenger is willing to take on the $2 monthly fee. An easy way we the people can say "FU" to the $2 fee is to either get paper vouchers to claim at certain in-person locations, or request a debit card to be used at automated machines, Clipper's website, or by phone. As for the $90K being spent on fixing the wireless coverage at Muni's yards, shouldn't this have been corrected years ago? If the wireless coverage was poor, shouldn't a provision in their contract would have made the adjustments and repairs FREE by the contractor? $73K for additional customer service support at Embarcadero station is not a bad idea. It's never open during the weekends. I have no comment about the contract increase for Booz Allen Hamilton because I don't even know what the hell they really do. Lastly, the $280K being spent on AT&T services is just an annual expense, there's no going around it. For the thousands of card readers out there, they all need a telephone or network connection to provide updates to the Clipper server and receive updates on new e-cash/pass purchases, hotlisted cards, and new software patches. There is a slight plausible reason for Caltrain wanting those Clipper portable readers. Stanford is not a station but a stop and only on game days or other special events. There are no ticketing machines there. Normally people going to or from Stanford go to Palo Alto station. Currently Stanford special events riders are told to buy tickets at whatever station they board from, usually a day pass. And they always say you cannot buy tickets at Stanford. The readers, I suppose, allow Caltrain the option of allowing people to load cash to pay fares at Stanford stop. It does not make much sense though. Caltrain does not spend money to install ticket machines at this stop for one simple reason: they only stop at Stanford a few times a year for football games. Someone needs to ask real questions about this boondoogle. Interesting blog. As a former San Franciscan I sympathize with the woes of public transit.